Tracking your menstruation cycle is important to get pregnant or avoid getting pregnant. There are just few days in each cycle that a woman can get pregnant - ‘the fertile window’. The most likely days to conceive are the two days before ovulation and the day of ovulation. Why should I track my period cycle? This fertility pattern is unique to every woman. Many women do not have the ‘perfect’ 28-day cycle with 7-day menstruation. Periods for most women last 3-7 days and the cycle can be as short as 21 days or as long as 35 days. Some women are lucky and get predictable menstruation length cycle every month, but most it is less regular. If a woman wishes to get pregnant her ovulation window may vary and that’s when a period app is very useful. 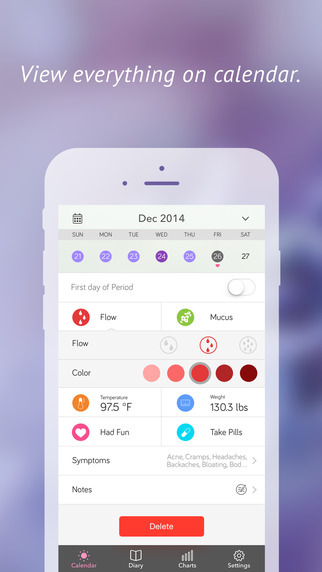 Ovulation apps estimate the date of your next period, based on the average number of days in your cycle. This way you have can estimate when your most fertile window is. We have picked one free ovulation calendar app for the iPhone and iPad – Monthly Cycles. - Sleek, easy to use design. - Clear calendar view of your cycle. - Able to add notes and symptoms in the diary. - Keep a chart of your weight and temperature changers. - Able to email data. What is your favorite Ovulation tracker app? How does it help you with your fertility cycle?